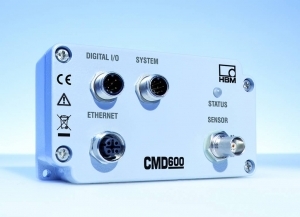 The latest CMD600 digital charge amplifier from HBM acquires signals from a connected sensor and makes them available to a downstream machine control either as an analog voltage signal or in digital form. In digital form the signal is transmitted using Ethernet as measured value streaming. Analogue voltage signals (0 to ±10 V) have a measuring bandwidth of 30 kHz. The CMD600 is compact, robust and noise-immune, and can be easily integrated into existing systems making it very suitable for industrial applications. Any standard piezoelectric sensors can be operated with the charge amplifier while sensitivity and the measuring range can be easily adjusted using the software, without loss of accuracy, in a range of 1:10,000. The CMD600 includes two functions to benefit users. The CMD Assistant software allows the user to configure the amplifier quickly and easily via the integrated Ethernet interface. The SensorTeach function is a recent innovation and is very user-friendly and efficient. It works following a single scan of the measuring range that enables the amplifier to automatically scale to the determined minimum and maximum values. The software includes an integrated stripchart making it easy to display and record the measured values. The robustness and accuracy of the piezoelectric sensors of HBM’s PACEline series make them particularly suitable for measuring mechanical quantities such as force and pressure in industrial applications. The amplifier supports Transducer Electronic Data Sheet (TEDS), so downstream amplifiers can detect and automatically use the measurement chain settings. The charge amplifier has two digital outputs for applications in machine control, and these can be used, for example, for rapid limit value control or peak value monitoring up to 10 kHz. Typical areas of application for the CMD600 are found in production, joining and forming processes, in test benches for engines or gears, and in research and development.